Does a boat have to have a name, and if it does, can it be any name? The week before Christmas and the extreme cold is back. ....but this year the temperatures are dropping so much at night and not rising that much during the day that the fresh water system is freezing solid, - even with all available heating appliances running all the time. I wonder how all the continuous cruisers on their winter moorings are getting on? It would appear we are not going to be able to get any proper use, at least with any level of comfort, until well into the new year. 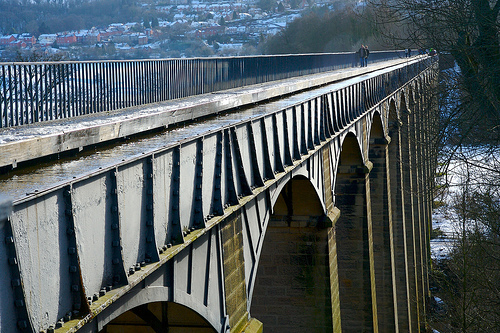 Awarded World Heritage Status in 2009, The Pontcysyllte Aqueduct was opened on November 26th 1805 at a cost of £45,000 and remains open for full use today. 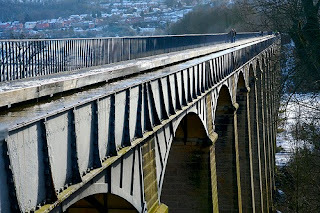 At 116 feet high it was the worlds tallest aqueduct for 200 years, taking The Llangollen Canal over the River Dee below.The bridge section, constructed solely from iron is 11 feet wide, 5.25 feet deep and 1007 feet long. The joints are sealed with welsh flannel, dipped in boiling sugar and sealed with lead. They remain today untouched and waterproof! As can be seen, there is a low fence on the towpath side, but nothing on the offside to protect the unwary boater from falling to the river below. We crossed this structure in August 2009. The original 1875 structure is approximately 60 feet high, modified to 80 feet high with the addition of the machinery deck in 1908. The lift is 85 feet in length with an additional 165 feet aqueduct linking the structure with the canal. There are 2 tanks which transport 2 narrowboats each from the Trent & Mersey Canal to the River Weaver below and vice versa. Each tank is 75 feet long, 15 feet 6 inches wide and 9 feet 6 inches deep each weighing 252 tonnes full of water. Restored to full working order in 2001, using hydraulics, passage can be made in your own boat, or in the company's own trip boat, pictured in the river at the bottom of the lift here. A Victorian Masterpiece of engineering. We left Kelly Louise in September, already prepared for the winter, as we were going on an extended holiday to Australia to visit relatives. Luckily we had emptied the fresh water tanks and blown the pipes in anticipation of cold weather before our return home at the end of November. When we visited last Saturday, in a temporary break to the current cold weather, we found her just as we had left her with no sign of condensation or frost damage. It pays dividends if you spend a little time, effort and expense preparing for the British winter if you intend leaving the boat for any length of time. I checked the bilge which was dry, ensured the multi stage battery charger was operating, and started and warmed the engine. Luckily everything was fine. I had owned a canal cruiser, a Norman 20, before we were married back in 1974. 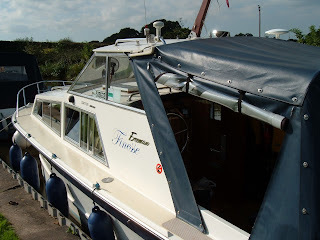 She was moored on The Lancaster Canal, and I had a great time with her for about 12 months, before selling her in favour of a Fletcher speed boat which I then used for water ski-ing. In the years to come, I married and had two children which put an end to my boating interests for the time being. 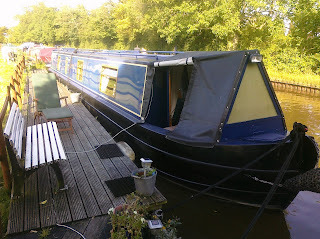 Thirty years later, in 2005, my wife and I decided we would like to own another boat, thinking this time along the lines of a narrowboat. But, being cautious of the costs involved in this, decided first to buy another cruiser to see if we both still enjoyed the pastime. We found our ideal cruiser, again on the Lancaster Canal, and kept her for three years before investing in our beautiful narrowboat, Kelly Louise, this time in Cheshire, doing much research in that time into exactly what features we wanted. She is a 2004 57 foot semi-traditional, fitted out with the necessary equipment to use her for long term cruising. It is my intention here to record our time with her including all the problems and pitfalls encountered along the way, aswell as documenting the time we spend cruising her. We both share an interest in the heritage of our canal system and consider ourselves lucky to be in a position to share that when we use our boat. I hope the information here is of use to anyone who may be considering investing in their own boat. We have owned her now since March 2009 and had two great cruises on her. This will take it forward from here.